The secondary screen is meant to be a dedicated area where only the most important things go - whether they are your closest friends or the apps you use most often, they go on the screen. Also, current notifications and reminders show up here, but with customization tools you can make sure that you see only the most important stuff. The secondary screen has surprisingly few settings. You can control when it comes on (based on the main screen, could be Always on as well) and you can select which of the pre-loaded features are available. There's a slightly different selection, based on whether the main screen is on or off. For example, there's no weather info when the phone is locked, which we find odd (it's a natural thing to want to check). Worse, basically no apps use this screen for any extra functionality. Only Google Play Music showed its playback controls there, but that's only because the secondary screen displayed its notification (which has those controls). 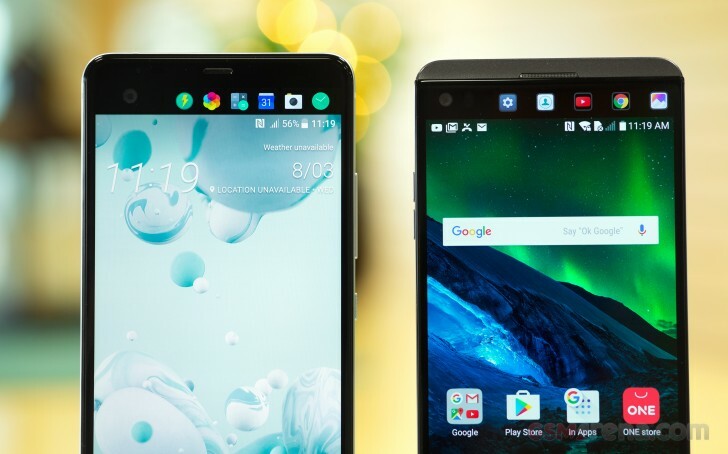 On the LG V20, camera, sound recorder and other apps put additional controls on the secondary screen while leaving the main screen entirely to the viewfinder or app interface. At this point we're not even sure if HTC provides the functionality for apps to display additional controls here. If that's possible, we really want to see HTC lead by example and add this functionality to its first-party apps. To us, this reduces the value of the secondary screen, it doesn't do that much more than an Always on screen like the LG G5 or Galaxy S7 have. The one thing we truly appreciate is that we can see the whole notification when it comes it, instead of just a tiny preview. Still, that's not quite enough. The Sense Companion is HTC's entry into the digital assistant field. AI-powered apps are all the rage these days and HTC's promises to learn from your behavior (by tracking info on certain sites and from certain apps) and be smarter about it than your average Apple Siri or Google Assistant. For example, by checking your calendar for long upcoming events, the Companion can prompt you to charge your phone, if it thinks the battery charge won't last you until you get back home from the event. If you have a long trip planned, the app will remind you to pack your external battery. The app features voice recognition and is always listening for the wake up word so you can call it to action from a distance. The U Ultra has four capable mics, giving the Companion great ears. Unfortunately, the app is a separate download and at the time we finished this review, it still wasn't available on our unit. Which is not surprising as the U Ultra is still not officially available in our region anyway. The HTC U Ultra launches straight with Android 7.0 Nougat, same as the Bolt/10 evo. The interface is largely identical, other than the secondary screen and the Companion (which can be downloaded on the 10 evo as well). We start with the fingerprint reader. 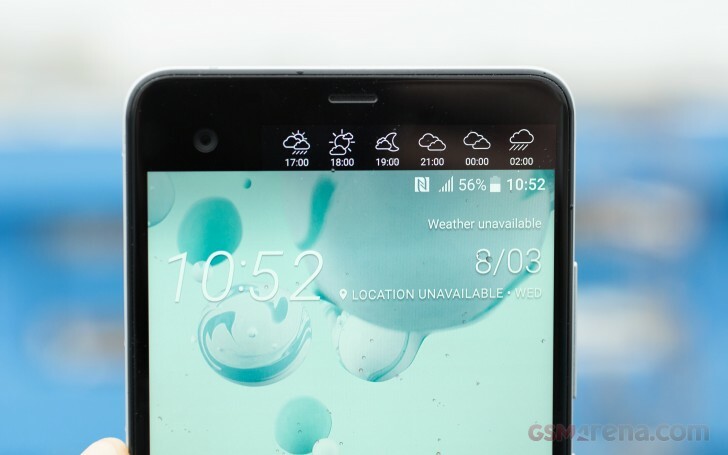 HTC claims it recognizes a finger in a blink of an eye - 0.2s. In practice, the phone sometimes took longer to be usable - it could take closer to a second before the screen is on and ready for you. The fingerprint has no other use beyond unlocking the phone. You can't use it as authentication in services, secure files on the device or anything of the kind. Swipe gestures are not supported either. The Sense Home hasn't changed much. BlinkFeed is still on the left, waiting for you to disable it or add content from various apps. All supported apps are listed when you hit the + button, even ones not installed (those take you to the Play Store). By the way, if you notice annoying notifications about Themes, "Designer updates", promotions from HTC and others, those can be disabled from the homescreen settings. Also here you'll find some data sharing toggles - precise location (used to recommend nearby restaurants and other places) and personal usage data (this one is off by default, it tracks apps you use, sites you visit, what you watch and listen to). The Themes app is a one stop shop for homescreen customizations. You can install whole themes or individual wallpapers, icon packs and fonts. We really like the Freestyle layout themes. Those not only change the wallpaper and icon pack, but arrange shortcuts in a fitting way. Notice that they also change the clock widget style to match. The App drawer feels very HTC. It's organized in vertical scrolling by pages with the dark background (you can set a custom wallpaper here). Unwanted apps can be hidden - there was a moderate amount of bloatware on the unit we received. The HTC U Ultra comes with 64GB of storage, unless you get the 128GB version. Of that, 16GB are reserved for the system and by the time the apps finish their first updates, you'll lose another gig. Moving on, HTC has left many Nougat things untouched. The Notification area is simple enough - one pull for toggles and notifications, second pull for all toggles. The latest version of the OS supports things like Quick reply, which allows you to shoot back a text message straight from the notification area. The App switcher is similarly unchanged. You can drag an app card to one side of the screen to go into Multi window mode. A double tap on the app switcher key alt+tabs between the two most recently used apps. Several power user toggles hide in the Boost+ app. There are automatic optimizations like Boost and Clear junk along with ones that give you the controls. Optimize background apps can disable apps you haven't used in 3 days (this can be disabled per app). Optimize foreground apps reduces the screen resolution they run at. This is good both for performance (QHD resolution may be too much for some games) and for battery life. There is no fine-tuning here, you can't adjust resolution and frame rate separately - an app is either optimized or it isn't, that's it.